The selection at the Wine Cellar on Leeward Highway. The island of Providenciales features many shops that carry a wide range of beer, wine, and spirits. The minimum drinking age in the Turks and Caicos is 18. Persons appearing under the age of 21 may be asked to show ID when purchasing. Spirits and alcohol at the Wine Cellar. There is no local restriction in selling alcohol in grocery stores, so alcohol and beer can be found in many of the larger supermarkets, including Graceway Gourmet in Grace Bay and at Graceway IGA on Leeward Highway. Popular American beers, such as Miller, Budweiser, and Coors, both regular and lite, can be found locally as well. 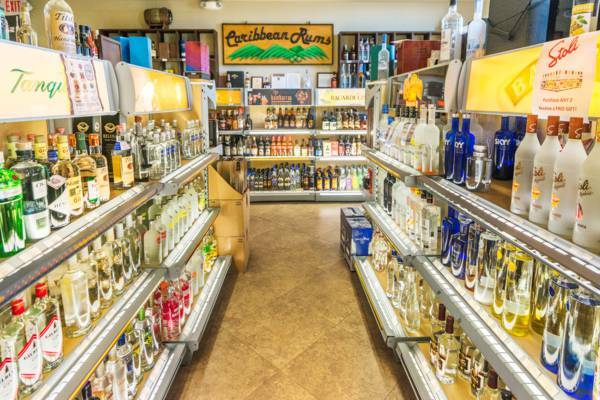 The The Wine Cellar - Discount Liquors on Leeward Highway stocks the widest selection of alcohol, wine, and spirits, including brands such as Johnnie Walker, Hannessy, Bacardi, Smirnoff, Rémy Martin, Absolut, Baileys, Grey Goose, and Woodbridge. 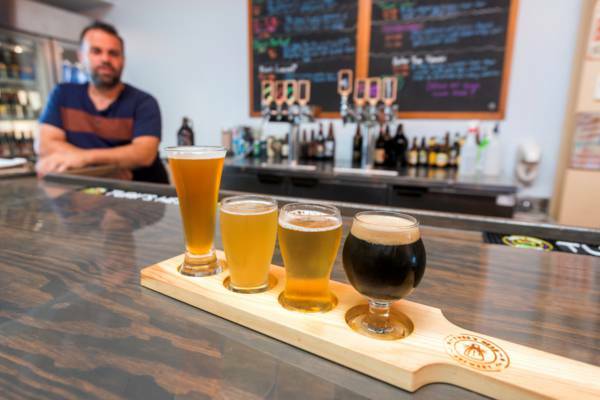 The Turks and Caicos has one local beer brand, Turk’s Head, which produces lager, IPA, amber, and a lite, in addition to special runs available in their tap room. There is also Bambarra Rum, a locally mixed rum blended from regional sources and named after the settlement of Bambarra on Middle Caicos. The gift shop at the Turk’s Head Brewery sells growlers which can be filled at the tap, so it’s possible to purchase some of the speciality runs for later. Craft beer sampler at the local Turks Head Brewery. The duty free shops feature a select collection of spirits and rum, including local and regional flavours, as well as the famous international brands. If you’re looking to take back home an authentic taste of the Turks and Caicos, be sure to stop by FOTTAC. FOTTAC stands for Flavours of the Turks and Caicos, and as the name suggests, this shop features local Bambarra rums and rum cakes, jams, chutneys, seasonings, hot sauce, and candies. In addition to the beers produced by the local Turk’s Head Brewery, there are several varieties of the locally blended Bambarra Rum and Osprey vodka. Bambarra Rum is available in several different labels, including Gold and the exclusive 15 year old Trouvadore. Popular imported beers, such as Corona, Guinness, and Heineken, is often cheapest by the case at the smaller variety and grocery stores in the Downtown area. The Wine Cellar typically offers the best prices on top-tier wines and spirits. In the Turks and Caicos, alcohol sales in shops and stores is prohibited on Sundays. Served drinks in restaurants and bars are still available. Residents and visitors over the age of 17 traveling to the Turks and Caicos are allowed to bring in certain amounts and types of goods duty free. This includes 1 litre (33.8 US fluid ounces) of spirits OR 2 litres (67.6 US fluid ounces) of wine (less than 40% alcohol by volume), per traveller over the age of 17. Goods in excess of the allowance will be charged duty according to the Customs Tariff. In the case of alcohol, duty is charged as a fee per gallon, as opposed to the percentage of value system used for almost every other type of good. Duty charges range from $11.91 per gallon for beer, $16.94 for wine, to $42.38 for spirits, vodka, brandy, rum, whisky, and gin. Travellers returning home also often have the opportunity to take back certain amounts of alcohol without paying import fees when entering their home country. The allowance and policies vary by country. See Customs Allowances for an overview for USA, UK, and Canadian residents. Several shops at the Providenciales International Airport offer duty free goods, which are alcohol, spirits, luxury goods and tobacco products which local import duties have not been payed on, and are consequently priced relatively low. In combination with the returning customs duty allowance of their home country, this allows travellers to bring back luxury products without breaking the bank. One interesting establishment on Providenciales is the Cuban Crafters TCI cigar shop. 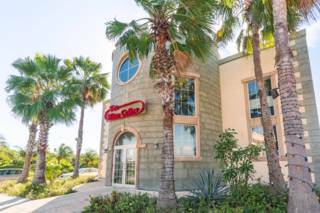 This shop in Grace Bay offers a wide collection of cigars, and also features onsite rolling of cigars. The tobacco leaves used at Cuban Crafters are grown in several Central American nations from Cuban seeds.